But, not as proud as he would be of the progress other countries have made in their recycling efforts: The U.S., which reuses about 28% of its waste, still lags behind Europe and some Asian countries. Language professionals like translators and interpreters often work with international businesses, government agencies, and non-profits (and some of us, like the Ecotranslator, even specialize in environmental translation services). This gives us the opportunity to observe, and share a broader perspective on environmental issues. Here’s a look at some of the recycling practices from around the world. The Germans pride themselves as the leaders in the battle for the environment, and rightly so. The country adopted a very successful recycling system, which is also rather complicated—at least for an uninformed tourist. In order to avoid being berated for disturbing the social Ordnung, it is important to have a brief lesson about the sorting process. First, there are bins for glass products, which must be sorted by color. Other recycling containers are also color-coded: Green bins are for all paper waste and packaging; cans, plastic, polystyrene, aluminum, and tinplate belong in the yellow bin; biological waste, such as leftover food, scraps, and peels are placed in the brown containers. The rest goes into the grey bin, unless it can be classified as “hazardous waste.” Paint cans, disinfectants, insecticides and other dangerous items are treated with an utmost care: A household receives a notice from a town council indicating the proper time and place for disposal of these items. Any large furniture pieces, like an old sofa or a broken chair, can be picked up from the curb but only at a designated time of Sonstige- or Sperrmüll (miscellaneous items) collection. And that’s not all—there is even a separate bin for batteries. In Switzerland, where handling of the world’s assets is the national industry, there is a strong financial incentive to recycle. While recycling is free and easy, in most parts of the country one has to pay for the garbage disposal. Each garbage bag must carry a special sticker, which costs about one euro, for the garbage truck to pick it up. Denmark, considered to be the greenest of the European countries, has also adopted a very eco-friendly lifestyle. However, the country does not have its own recycling plants. How does this work? From the economic efficiency standpoint, Denmark produces too little waste per capita to justify construction and operation of recycling facilities. Plastic waste, waste from electrical and electronic equipment, batteries—items that cannot be incinerated or classified as a landfill waste—are exported for recycling abroad. Some argue that Singaporeans take littering a little too seriously. The country’s litter laws date back to 1968, when the authoritarian Lee Kuan Yew launched a war on litter. If you are unfortunate enough to drop a plastic bad or a cigarette bud in a public place, you will have to pay around $1,000. Plus, you will get a “community work order.” Wearing a fluorescent yellow vest, you become a “litterbug,” working with a mop to make the squeaky streets of Singapore even squeakier. Being a litterbug is condemned by society and can be especially ostracizing for the elderly citizens. 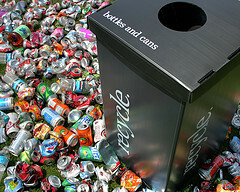 Recently, the European Union has obliged to force its member states to recycle 50% of all the household waste by 2020. The U.S. has less ambitious plans. Given a small chance that these goals will actually be achieved, the only thing that should never be recycled is empty promises. ALTA Language Services has provided language training, testing, and translation to U.S. corporations and government agencies for 30 years. For more information about us, please visit our website at www.altalang.com. I once had to translate: Minimum 30% post consumer waste! I translated more or less: At least 70% recycling material! Well, this is a fab site for information about recycling around the world, but the only problem is that there aren’t enough countries that are written about.